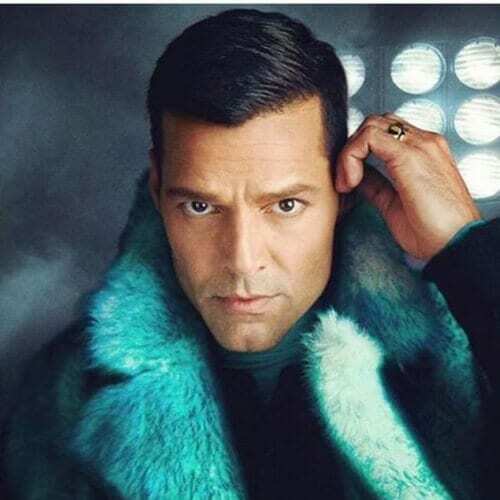 The world has rediscovered Ricky Martin. 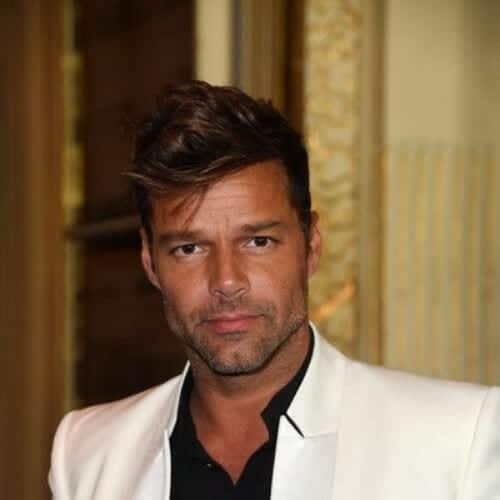 After more than 30 tumultuous years in the music, television, and film industry, this one of a kind but complete entertainer who can do it all and has no limits has been discovered once more by the world at large, mainly thanks to his role in the hit TV series The Assassination of Gianni Versace. Therefore, his older shows have been revisited as well, his music is topping all charts. And everyone wants to copy his look. 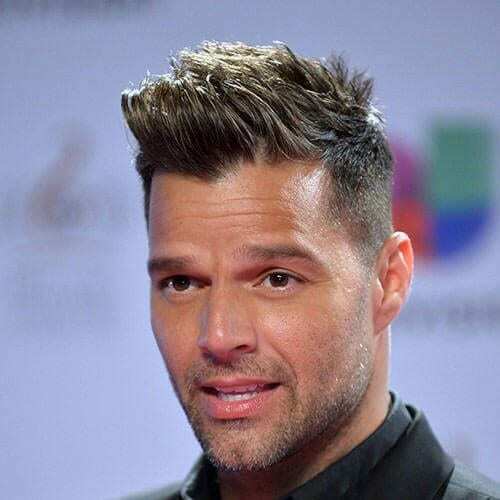 To help you out, we’ve compiled a list of 45 Ricky Martin haircut ideas. 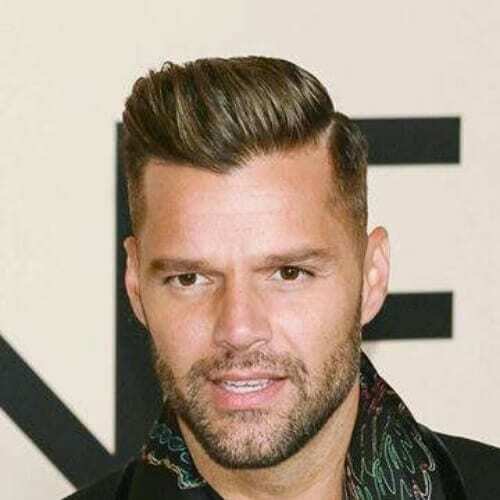 When you’re literally one of the most handsome men in the world, it’s easy to pull off just about any hairstyle you want, and Ricky Martin has not shied away from trying more than a handful, as you are about to see in this article. This high comb over is one of the singer’s best choices hairstyle wise as it elongates his face and highlights his cheekbones. 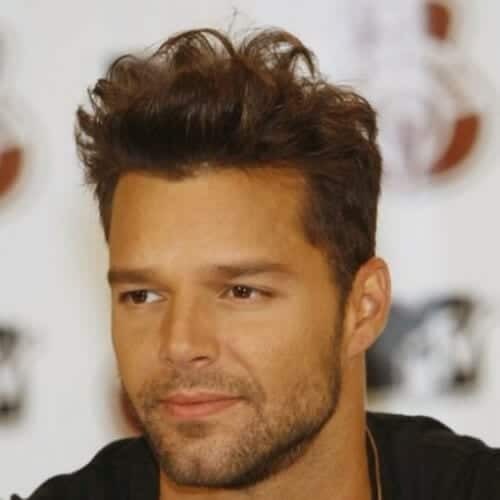 If you have a similar facial structure to Ricky’s, this is definitely the haircut to go for. 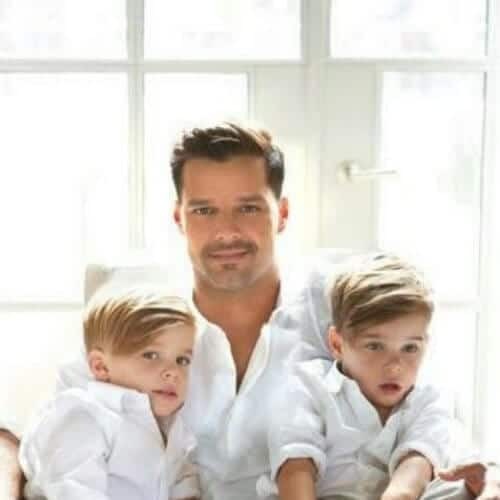 Ricky Martin has two sons, Valentino and Matteo, twins. Here they are in a cute family portrait, all dressed in white and sporting the same classic comb overs with side parts. The perfect haircut for both a handsome man and two perfect little boys. Is there anyone who doesn’t know the video of Ricky and Christina Aguilera performing Nobody Wants to Be Lonely? You must know it especially if you were a teenager during the 90s. Then you must also know that shabby-chic-romantic haircut he wore. Plus, the denim shirt. Wow! Here’s one you might not be so familiar with. 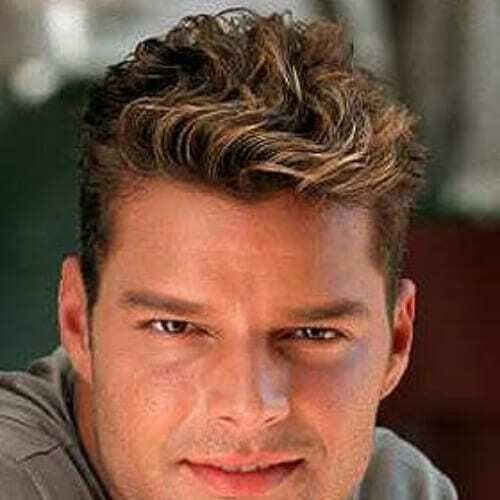 During the late 80s and the beginning of the 90s, before he broke into the US and English speaking market, Ricky used to sport this medium haircut with a slick back and some blonde underlights. Still going back into his past, here’s a version of a younger Ricky, looking like a teenager with shaggy, spiky hair and just a hint of a five o’clock shadow of a beard. You can also see his famous tattoos peeking out from beneath his sleeves. Speaking of looking like a teenager, here’s an actual photo of him during his teen years. You might think he was in school, but you would be wrong. Ricky started his career when he was only 12. By the time this picture was taken, he was already famous in Latin America. That’s right. He also sported a mullet. 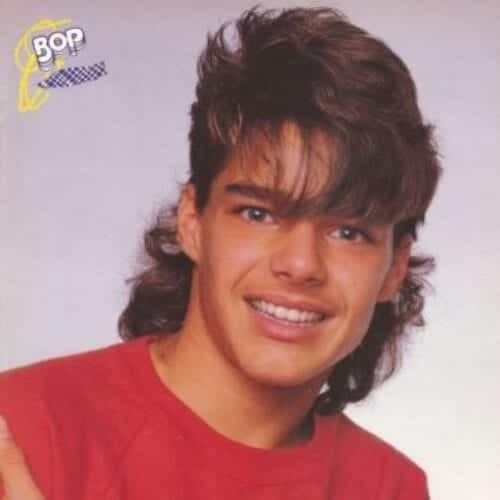 This was back in the 80s when he was part of the Puerto Rican boy band called Menudo. 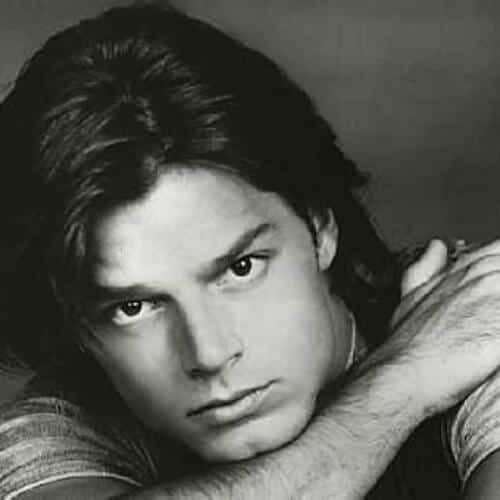 Oh, you didn’t know that Ricky Martin was in a boy band either and that he used to wear a mullet? It’s a good thing you’re reading this article, then! Here’s a more recent shot of Ricky with a long slick back that falls carelessly over his forehead. The sides and back are tapered and only the top has been treated to a bit of gel. We’re not huge fans of the green, gray, and pink shirt, but when you have hair this pretty, who cares? It’s back to the 90s with this quintessential look that everyone seemed to be wearing during that decade. It’s the iconic haircut with the medium length hair parted down the middle and side bangs curtaining the face. Since we’re talking about bangs, it’s also important to note that Ricky also tried cropped baby bangs for a while. They were asymmetrical and side swept. Also, he used to wear them in combination with a set of messy spikes. You might be more familiar with this hairstyle since he wore it in a few of his most famous videos to date. They go back to the 90s, but they were so popular that the world still remembers them. The hairstyle is short and sweet with little blonde curls. With new music, you always get a new look. That seems to be the rule when it comes to very famous musicians. Therefore, when he approached the music scene once more after a hiatus, Ricky saw fit to show us a new side of him. This is a look as close to perfection as you can hope to get. A gorgeous side-swept haircut, a stubble, and a superb black suit that cuts a dapper figure and highlights your best angles. 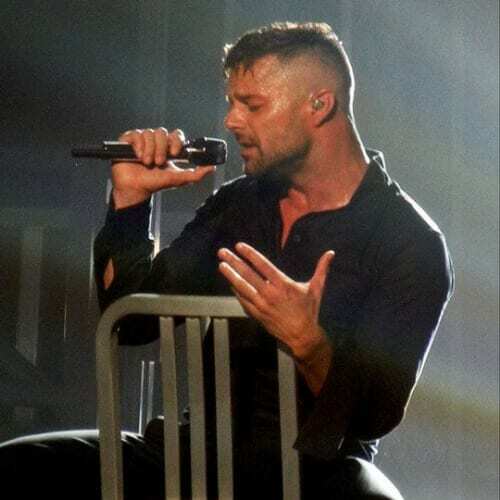 Ricky Martin sure knows how to bring it! Here’s another entry on the list of surprising things about Ricky. He also used to wear a goatee. 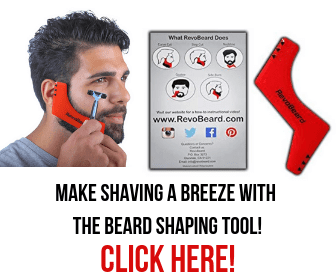 If you’re interested in finding out more about this type of beard and the hairstyles it matches, we have a whole article on it, inspired by celebrities. As we said in the beginning, when you look this good, there is nothing you cannot pull off. Not even a buzz cut. But the really interesting thing here was that Ricky’s buzz cut revealed that he has a widow’s peak. 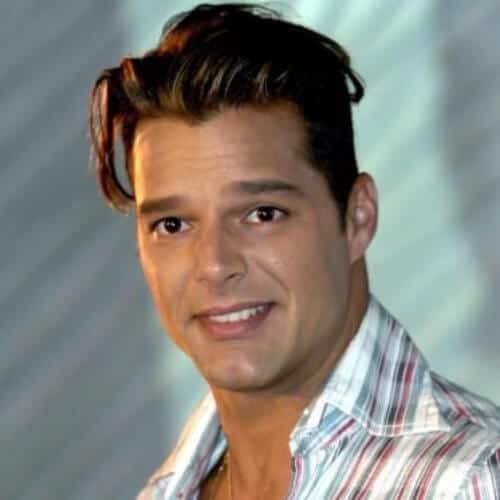 The 2015s have been very kind to Ricky Martin. He really seems to have discovered the secret to eternal youth, doesn’t he? 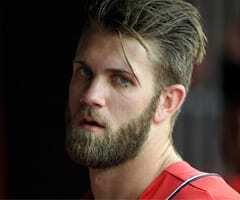 Here’s he is with a temple fade, and a gelled comb over, plus an overgrown beard which he wears fantastically well. Say what you will, but this 2000s classic look with long spikes is still our favorite. 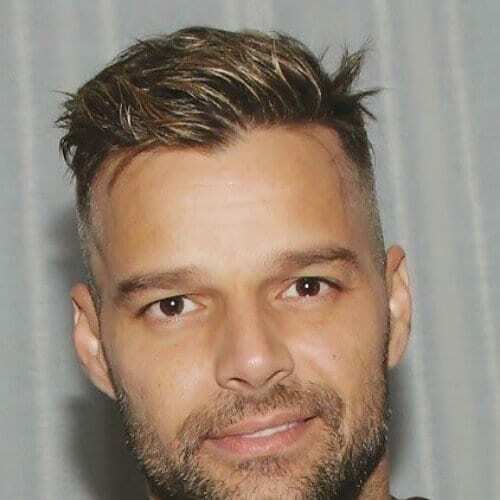 We may be biased since this hairstyle might be recalling memories of our childhood of Ricky Martin singing Living La Vida Loca on the TV and looking like this, but one cannot deny how great he looks, right? A blowout, a minimal goatee, and glasses. 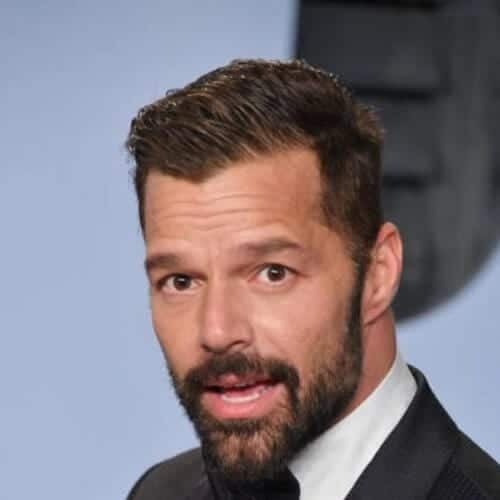 Ricky Martin has really tried everything, hasn’t he? The thing is that he can pull everything off, so there’s really no harm in experimenting with haircuts, hairstyles or facial hair, for that matter. Most men who are as handsome as Ricky and who are happy to possess these coveted chiseled, masculine facial features would never dream of covering them up with a beard. Ricky pays no attention to that and goes for an off-duty and casual style. Ricky also went for the very contemporary shaved fade haircut with only a long top. Here he is sporting this very same haircut while performing during one of his concerts. He paired it off with a small beard and fading sideburns. 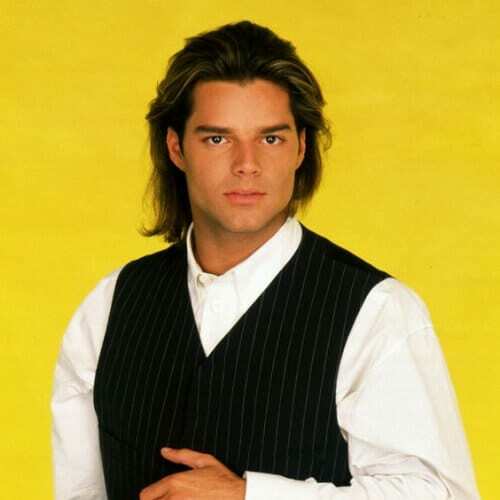 Did you know that, in 1994, Ricky appeared on General Hospital? He played Miguel Moralez who was a bartender and a singer. 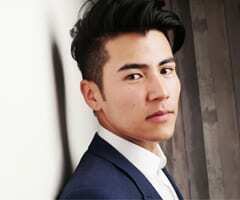 Unfortunately, he didn’t enjoy his time there as the rest of the cast shun him out because of his different nationality and accent. 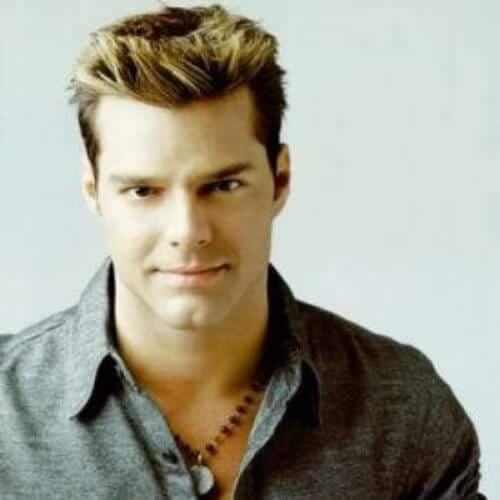 Talking about his acting career, Ricky also appeared on a number of Latin American soap operas, in another American sitcom called Getting By, and in a play by the name of Mom Loves Rock performed in Mexico City. His most acclaimed acting gig comes from 2017 and is his role in the TV series The Assassination of Gianni Versace: American Crime Story where he played Gianni Versace’s partner. 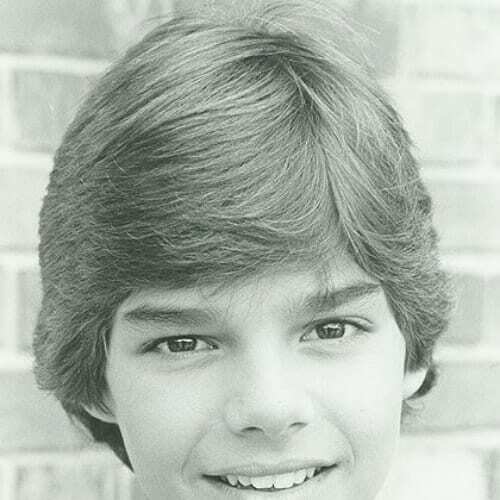 Ricky was highly acclaimed for his portrayal and the world was fascinated with his acting skills. 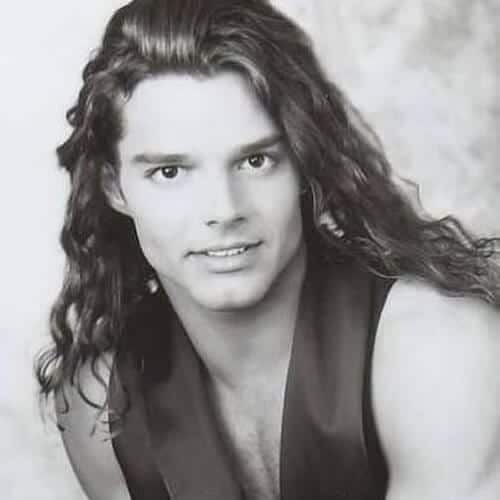 Here’s a throwback picture of Ricky from his early days when he used to sport long hair. We love the fact that his long hair is also a bit curly as we believe this is a really good look on him. We’re also huge fans of that awesome 90s fashion style. Ricky also tried his hand a bit at some blonde spikes. It seems only natural because he has a beautiful olive skin and gorgeous toffee colored eyes. Therefore, a bit of blonde in his natural chestnut hair can only serve to highlight his innate beauty. As of 2017, Ricky has announced a residency show in Las Vegas called All In. 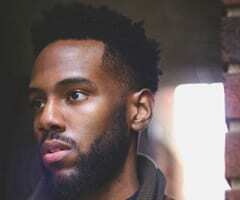 This means that, while you are in the neon city in the middle of the Nevada desert, you can catch this fantastic man perform live anytime you want. Here’s a fun fact. Ricky has his own line of lip balms which you can buy. They were released in 2012 with the help of M.A.C Cosmetics and in collaboration with Nicki Minaj. They are called Ricky’s Lip Conditioner and are part of the campaign Ricky and Nicki for Viva Glam. The more you know! Although this was a haircut the Ricky used to wear in the 90s, it has now come back in style, proving that fashion is, indeed, cyclical. 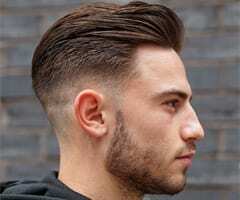 This is a short haircut with tapered sides and a layered, blowout top, with just the right number of highlights in it. Ricky has definitely been a fan of bangs throughout his life and career. 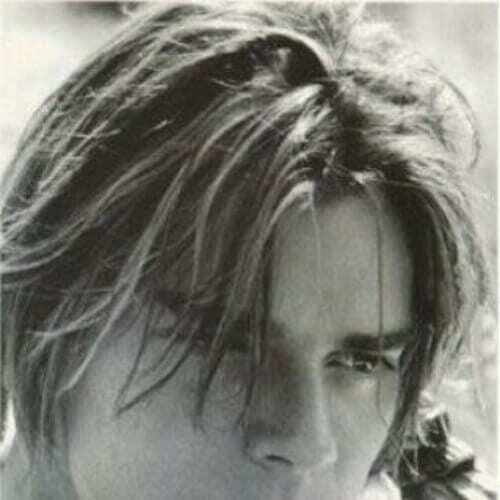 He was a true child of the 90s and went out of his way to give bangs the place they deserved. Here he is with a ruffled fringe in a sweet chestnut. A hard part is essentially the same as a normal hair part. The difference is that your stylist or barber has to create it using a razor so that it can look a bit more pronounced than a natural one. Therefore, it’s best not to try this at home. We’re back to the 80s with this gorgeous haircut of Ricky in his twenties. It’s a medium length style that has a healthy dose of romance to it. It served to really sweeten up his facial traits and establish him as the heartthrob that he still is to this day. Here’s another interesting fact for you. 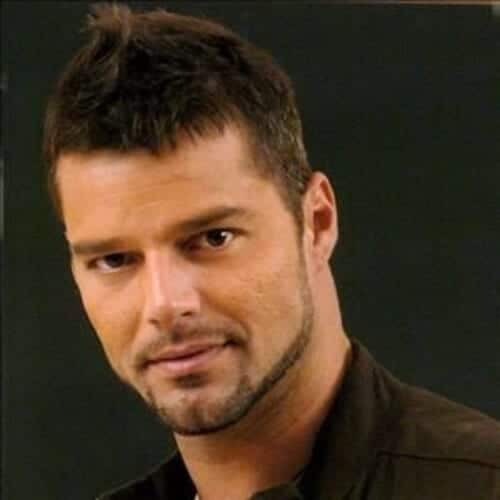 Ricky Martin is so over the top, larger than life popular in Puerto Rico that the 31st of August has officially been declared by the authorities as International Ricky Martin Day. Just in case you were wondering, no. He wasn’t born on that day. Ricky was born on Christmas Eve. 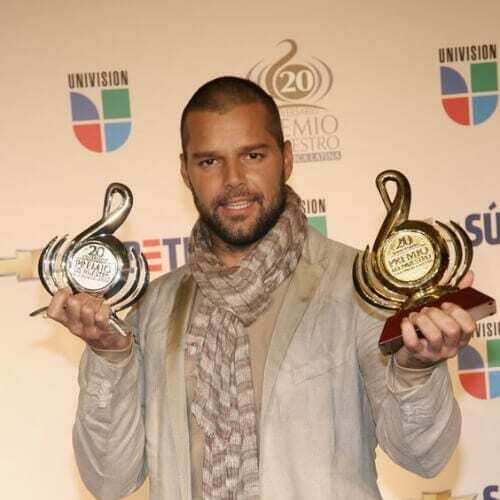 Speaking of just how famous Ricky Martin really is, this might clue you in. Ricky has also received the key of Miami Beach, Florida in 2007 from the mayor himself. Rita Moreno was present at the ceremony. Here’s one of our favorite Ricky haircuts. It’s incredibly youthful, playful, flexible, and fluid. It also requires very little maintenance other than treating your hair to some conditioner after you take a shower, to ensure maximum moisture. In 2007, Ricky also receive a much-coveted star on the Hollywood walk of fame. If you want to visit it and take a selfie there, you can find it right next to the Hollywood and Highland Complex. Needless to say, Ricky is extremely proud of this achievement. Speaking of selfies, here’s how Ricky looks like when he takes one himself. He goes for a casual look with tousled hair and his everyday stubble, distressed jeans and a very simple white T-shirt. And, of course, his tattoos. When Ricky decided to dye his hair, he went for a shade lighter than his usual color, which is to say he opted for this scrumptious honey brown. It was a fantastic choice because honey brown is one of the best-selling hair colors of the moment for both men and women. Another accolade that Ricky received was from Spain. The country awarded him a citizenship as a thank you for all his amazing contributions and achievements in arts. If you’re wondering why Spain in particular, that’s because the singer has Spanish roots. A great way of highlighting your facial features is by sporting some blonde tips. It’s also a good idea if you want a change to your look but cannot fully commit to blonde hair or are afraid of the damaging effects of the dye on your hair. Another typical look of the 90s is the medium length cut with long bangs parted down the middle. It seems that just about every guy in high school or in his very early twenties was wearing this haircut back then and you are lying if you pretend you didn’t want it as well. But the singer has come a long way since his early, 90s pop star look. He is now a fashionable international superstar with a mature and sophisticated taste in fashion and style. 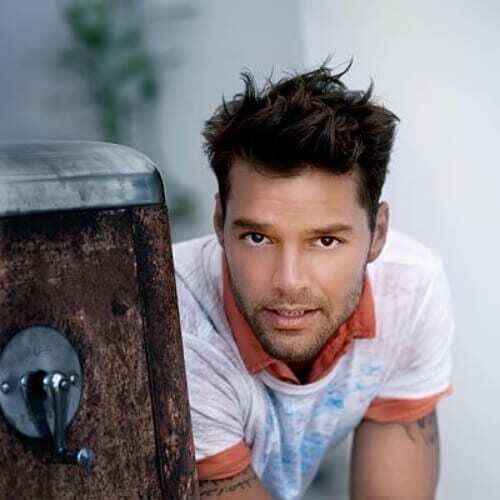 In other words, Ricky Martin has moved through the years with grace and elegance. 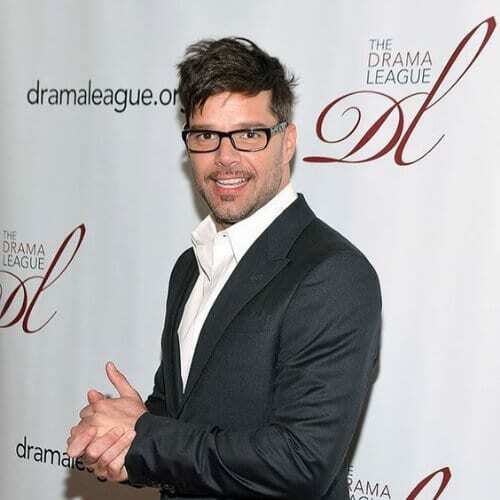 Ricky is also the author of a children’s book which appeared in 2013 in both English and Spanish. The book is called Santiago the Dreamer in Land Among the Stars and it’s about a little boy who dreams about being in the school play but starts doubting himself after he is not cast in it. Soon, however, thanks to his father’s support, he will achieve his dreams. 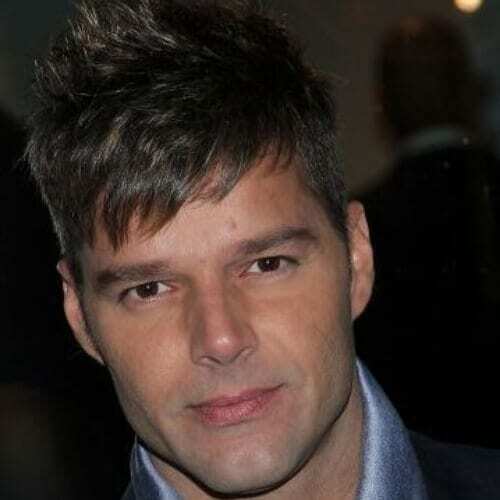 This might just be the most famous Ricky Martin haircut of all. 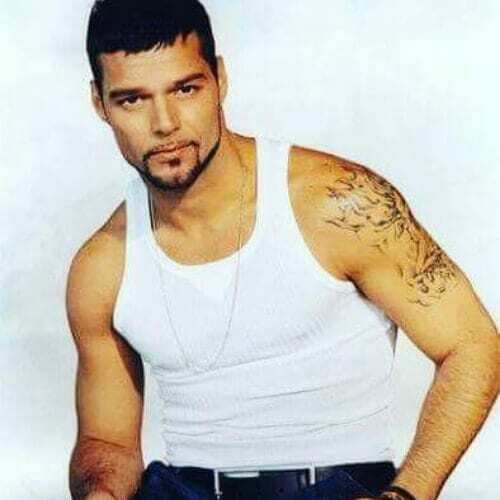 This is his look through the late 90s and the beginning of the 2000s when he recorded hit singles such as Vuelve, She’s All, and, of course, his biggest hit ever, Living La Vida Loca. 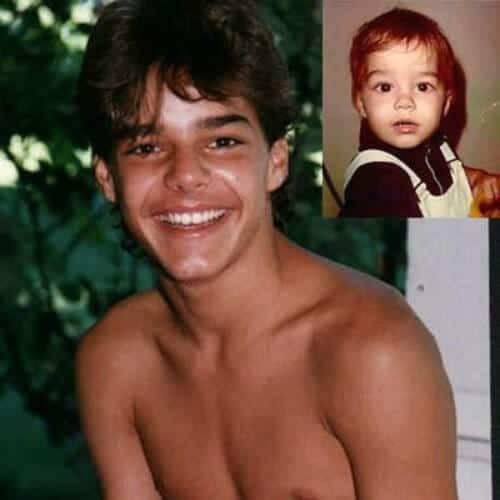 Here’s a cute collage of two pictures of Ricky, one when he was a baby and one of him as a teenager. When he was just 12 years old, Ricky starred in over 10 commercials for household products in his native country. That’s what started his career. 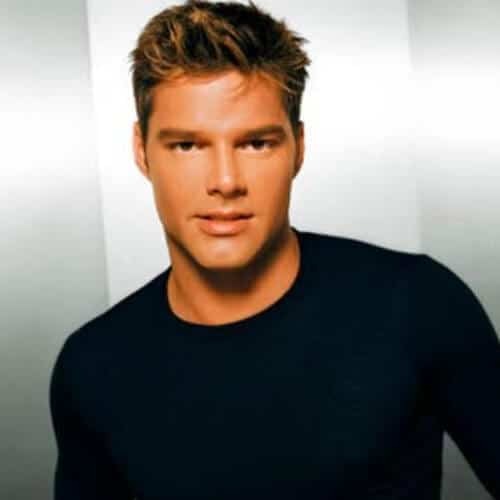 Studying the list of Ricky Martin haircut ideas is undoubtedly a trip down memory lane. This international superstar is a singer we’ve all grown up listening to and watching on TV. 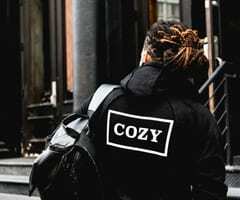 His personal style ranged from mullets and long, curly hair in the 80s to his famous short, layered crops in the 90s to his ultra-modern slick backs and tapered fades of the 2010s and 2015s. 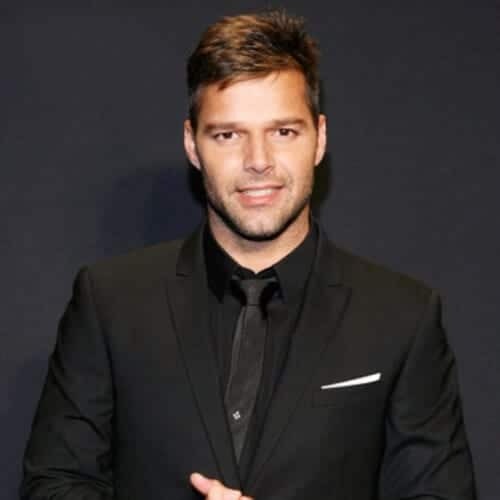 It all just goes to show that Ricky Martin will never go out of style!